Our current customer base includes users with PDF needs from almost every country of the world. Free app to manage PDF files, alone or in bulk, over the web. iLove PDF offers a toolkit to merge, compress, split, convert, watermark, and unlock PDFs within seconds. iLovePDF also converts from/to main Office formats such as Power Point, Excel and Word. 1.- Presents a very easy to understand and intuitive environment that allows you to easily pass your pdf to other formats such as word, excel, ppt. 2.- You can join two or more pdf files without any problem and in a very fast way. You can also divide the pdf file, which is especially good when the file is of images. 3.- Along with the above, this useful tool allows to reduce the total weight of the file in order to be handled more easily since many times the large files can not be attached to the emails. 4.- Like all programs of this type you can add custom watermarks, and you can also number the pages. Cons: As a disadvantage, the program may only have the defect of not having an element that allows transforming pdf into epub, which could make a difference in relation to other similar programs, especially if the processing system could avoid the double jumps usual in those processes. 1.- Add watermarks in files made by me and that I have to share with coworkers, which prevents them from modifying or appropriating it. 2.- when the pdf files contains images or are only images, since this way I can extract only what is necessary for me and eliminate the rest of the document. Pros: iLovePDF is a valuable tool when dealing with PDF files daily. It allows you to edit PDF files doing such things as merging files, splitting a file, compressing a file and converting a file. These are all useful functions that I have used and before and often and every one of these functions works perfectly. The functionality is easy as you simply have to drag and drop the files within the website or you can look the file up within your saved files and there is a button to click which does the work for you. Cons: There are very few cons using this program, one thing I would recommend is that when you are editing a file such as merging it and you click the merge button the file would automatically download, rather than having to click download file afterwards. Overall: iLovePDF is the most useful PDF editing tool. I have an Adobe Acrobat Pro account as well and I find it much harder to edit PDF's within Adobe than using iLovePDF. Pros: I like iLovePDF platform for many reasons. It is very simple and easy to use and there are so many options available on the website. I use it most of the time to merge many documents together and compress my files. It is a great platform. Overall: ILovePDF is a free tool that helped me to safe money. It does the same job like any paid software and for FREE. Cons: More privacy and security are needed to make sure that my documents are secured. Overall: It saves my time so I highly recommend it. Compressing pdf files doesn't take anytime and very easy to use. 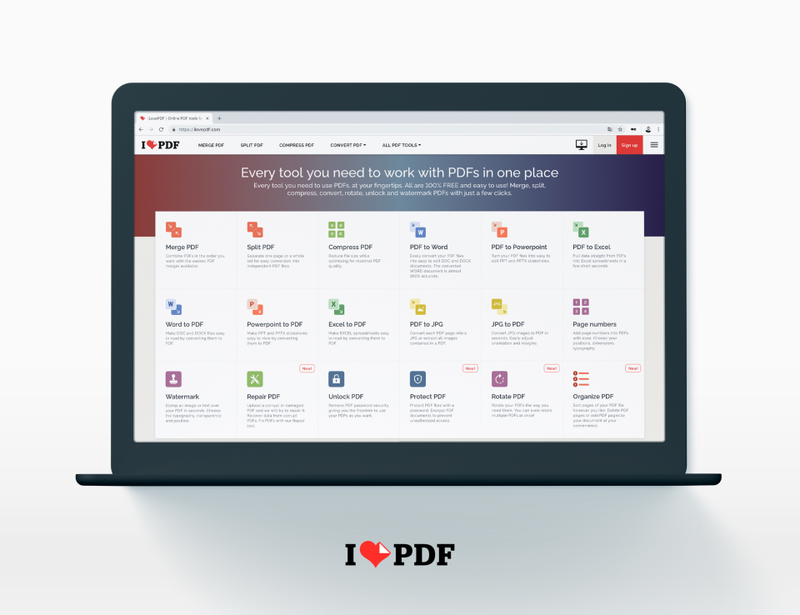 Pros: iLovePDF is cool online platform to PDF management. I consider it as the All-in-one PDF solution. The website has too many features and can be used easily. I usually use it to combine documents together and convert PDF to other extensions like Powerpoint and Excel. The tool is useful and can be accessed from any computer. Cons: There is nothing that I complain from so far. Overall: I highly recommend this tool for its simplicity and ease of use. Pros: iLovePDF is a solid online service for editing PDF files, offering a nice range of tools mainly focused on converting PDF files to images and Office files and vice versa. You can also split, merge or compress files as well, being common features in most similar services. However, there are two that are not commonly found: being able to stamp a watermark over the file and to place page numbers. Something else that is worth mentioning is that there is not a time limit for converting files, however, there is one for batch uploads (which is oddly based on a cookie rather than the IP). Cons: The compressor isn't as powerful as Small PDF, and I found a few glitches with heavily edited Office documents. The premium service, despite being a bit cheaper, has some limitations. One of them is the size limit for compressing files, being smaller than some design or print files. Overall: Despite that SmallPDF is my main choice, I have been using iLovePDF quite often in other computers as it offers to convert several without a time limit for free. Pros: iLovePDF is one of the best PDF online tools to use. It helps me to convert any file type to PDF. This tool is amazing it has a feature called "compress PDF" which really reduce the size of the document without reducing the quality. The website is very easy to use and fast in converting the files. I really like using this tool. Cons: There is nothing that I don't like about it at all. It is a great tool available for free. Overall: Amazing experience. I use this tool for converting and combining documents for school. Pros: I love pdf is an online tool that allows me to join, divide, compress and convert word, excel, power point and image (jpg) files to PDF format. I love its interface, it's very explicit, so it's quite easy for me to use this software. Is free. Cons: In its operation I find nothing ngative. The only inconvenience that could arise is related to the internet, which because it is an online tool, in case of failure the connection would not be possible to use it. Overall: I have the benefits of PDF, thanks to this tool. Pros: This is an absolute game-changer with PDF files. I have used both the free and paid versions of the PDF software from the big name company and a few smaller companies... but iLovePDF is an easy and powerful way to manage your PDF files. Cons: Nothing - it does what it says it will do and it's fast and powerful. It's really a Lovable software for all PDF users. Pros: The best thing about this software is its efficiency to convert all kind of office files into PDF and vice versa. Cons: Its iOS app is slightly buggy. It's sometimes difficult to operate. They should work on this app. Overall: My experience with this application is very good. It really helps me a lot with my office files. Pros: my number one option for converting PDF files seems super useful to me, very easy to use and certainly very comfortable. Pros: This product is insanely easy to use, reliable and is also an incredible timesaver! Cons: There are a lot of advertisements on the site but it's not that much of a distraction and very worth it. Overall: This product is such an efficiency booster and is just so easy to use. I would recommend it to everyone. Pros: What I like most is that it facilitates the work by joining pdf and separating. It allows to recognize text, edit and re-join. Pros: I love this tool for many reasons. First, it is so easy to use and to upload documents to the platform. Second, It is accessible from any computer. Third, it is a very convenient tool to convert, edit and merger any files to PDF format. Cons: Sometimes while uploading a big file the upload will stuck and I have reupload again. Overall: This platform allowed me to manage my pdf documents online in an easy way. It is a tool that allows me to work with pdf file, in a fast and simple way. Pros: t allows me to convert diversity of formats such as word, excel, power point, publisher, jpg, png, bmp, among others to pdf format, besides this it also allows me to unify, divide, compress the pdf file and order it according to the requirement, also This tool allows you to convert file quantities at once. Cons: As you need to convert at the same time more than 20 files, then you will have to make a purchase to expand the conversion capacity of this tool, the cost will vary according to the number of files that are required. Pros: It is an extraordinary tool. It allows you to convert files in word, excel, power point and jpg format to PDF online. It's free, easy to use, very fast and intuitive. It has a good interface. Cons: There is nothing negative that I can add in relation to this tool. I think it's very helpful to have her. Overall: Union, division and PDF converter online. very very very few editing tools compared to even pdf expert or the likes. look and feel of the app is so obsolete. Overall: free functions that no one else give you like splitting pages etc or other editing tools are always welcome. it should have been better experience if the process had to take place on the device itself. Pros: Ilovepdf is an excellent pdf online editor, which allows me to upload my files easily and quickly to convert or edit, it is compatible with all operating systems, it has an easy to use interface and it is free and has multiple options such as splitting, convert, compress between others. Pros: Is easy going, helps with more than one function. Cons: I don´t have any complains, is simple, nice and easy to use. The simplest way to modify PDF!!! Cons: When some PDFs are converted, part of the format of the text or tables is lost and an internet connection is required. Overall: It's totally free and very easy to use, very intuitive. Pros: That you can literally just drag and drop pdf onto the page - click on covert and within seconds drag your converted document back to the file - its brilliant! Cons: Will only convert three documents at any one time - so if you have more it takes a little longer. Overall: I have been using this website to convert pdf to jpeg all day everyday for two weeks its been brilliant. Cannot recommend enough!!! An all-rounder PDF tool for all your office files. Pros: It is a very easy and helpful application for converting all kind of office files into PDF and vice versa. In my profession I use it mostly for JPEG to PDF conversion. It gives very good results. Cons: It doesn't process big files. That's the only drawback I found in this application. Overall: I use this app for converting my JPEG files to get better print for my designs. Pros: This does exactly what it intends to do. Cons: You can do this and more through google or event copy and paste. Don't waste your money. Reducing PDF size without big loss of quality! Pros: I'm a design student where I have to submit pdfs with giant sizes all the time and it's very important that the quality of the images are kept. In order to squeeze the pdf I ALWAYS use this website as you can decide if it should reduce the size a lot or only a bit. The best thing is that it really keeps the quality but reduces the size SO MUCH -> from 150MG to 10MG! And it's for free! Cons: Cannot really think of any negative point apart from the fact that they maybe keep your file saved. Pros: It is a free tool that helps me to edit and modify my PDF files. It is very easy to use. I use it to merge or split PDF files. Also, I convert my word documents to PDF and vice versa. Cons: Sometimes it crashes but still it is a very good free tool. Overall: iLovePDF helped me a lot in converting pdf files to word documents and to JPEG. Pros: We have the option of joining files online and after uploading the files, and some time, the results are great. Pros: I love pdf let you do a lot of things with your pdf files, like join documents together, turning word documents into pdf and vice versa, and other useful things. Cons: Sometimes can take a while to convert some files, but in general is great! Overall: Joining a lot of documents together in a final document. Pros: A really comprehensive online tool that allows a variety of options for pdf and word based issues. It's a great, free alternative to using some of the brand names that are associated with PDFs and is fantastic when you need to convert a document or merge a document. Cons: Could be a little difficult to use for those that are less used to navigating round the page. Due to the adverts, sometimes it might be a little tricky to work out where to press on the page. Overall: Using this software over a paid software is a great alternative when you're not a card holder at work and you require the services that it can provide. Pros: I discovered iLove PDF by chance and I was genuinely surprised with all the useful options it offers. It's as simple as it can be. You just upload a file that you want to edit, select the options, wait for a little bit and it's done. For instance, the compression feature is more than useful. I have managed to compress a PDF file from 10MB to 400kB and it still had a decent quality. Cons: I really can't find any cons due to the fact that this service is completely free. Excellent PDF manager for all your office work. Pros: Its file compression feature is one of the most useful features for me. In my work i need to send documents which occupy less space in the email. And this application do this work very efficiently. Cons: Heavy file restriction is the only disappointing thing i fount in this tool. It doesn't allow to upload more than 8MB file. Overall: It helps me to reduce sizes of my office documents for sending them via email. Pros: With this we can compress,cut and join documents.Transform documents in Word,Excel to pdf format quickly and easy way.Also pass pdf files to other formats.We can also add page numbers,watermark and can also rotate files. Cons: The amount of files we can work is limited to few numbers.The amount to pay for file conversion is little higher.Sometimes the conversion process becomes lag. Overall: Helped me to protect the authenticity of the documents.It has allowed me to create files parallel. One-stop shop for all your PDF needs. Cons: This i'm not really sure but I think the converted docs becoming blurry for some reasons. I haven't tried using other PC though, but I think this is not the issue for everyone. Overall: There's a whole lot more that you can do. You can merge, split, compress, convert PDF to other files and vice versas, put watermark, etc. Pros: iLovePDF is the best online PDF manipulation sites on the internet. Gone are the days of googling for a specific converter and picking a random one. Since I have discovered iLovePDF, I now have one site that I know can do all the conversions for office files and images files in both directions. Best of all its free. Cons: I cannot think of any issues I have had with this software, it does what it says it does and it does it well! Pros: I Love PDF is a tool package that not only allows me to edit (unite, convert, edit, compress, add number of pages) my Pdf documents, but also I can remove password and unlock pdf files. It is easy to use so it does not require great experience to get the most out of it. Pros: The freedom to work and modified a PDF file is amazing, ILovePDF is specially handy when you need to make a quick fix on a PDF documment. Cons: Sometimes in irritating that in certain document files you loose the format. Overall: Good app for working with PDf files and edit them easily. Pros: Easy to convert PDF into any format. I use it to merge my pdf files. It has all the tools that I need like compressing, splitting and merging PDFs. I like that it is free to convert my pdf files into word documents or jpeg. Cons: Security tools are needed to protect the files. Overall: I highly recommend it to all students. It is a very useful tool that helps me to convert any file into different formats for free. Pros: iLovePDF is a great online PDF tool, especially for PDF conversion. It's super easy to jump online with this and convert a PDF back to Word for free. It contains other great conversion tools as well. Cons: There are other online PDF tools, such as Cute PDF, that provide better security tools, but all in all this is a great tool. Pros: Really great tool with lots of options and really easy to use. Cons: No cons that I can think of, does all what I expect it to do. Pros: iLovePDF is a set of online PDF tools. It's free and as far as I could see there are no limitations. They have a desktop version of what they offer online, but it comes with a restriction: 5 tasks or a monthly/ yearly subscription. Generally, there are three reasons why I resort to online PDF tools: to compress PDFs convert them to Wordn and unlock secure documents. Well, iLovePDF does a quick and very good job. Give it a try! Cons: There are no drawbacks I could highlight because I haven't noticed any yet. Pros: That compressing option is the coolest thing in the app. It saves a lot of Mobile data while sharing. Cons: Can't edit without an Internet connection.. Need more updates.. Overall: It will be better if I can use this Without Internet connection.. Adding an option to edit or add pics to pdf would be great. Fast, easy to use and free. Pros: I use this web service whenever I'm not at home and I don't have all the tools necessary at my disposal. Merge, split, compress, save it in another format, create a watermark It's a life saver if you are in a rush and/or if you can't use more professional tools like Adobe pro or Illustrator to edit/manipulate your PDF. Cons: I don't anything negative to say about this app.